Look yummy, don’t they? My piping skills leave something to be desired, yes. But the taste makes up for it. My decorator tips were missing so I had to work with what I had. I’ll work on my cake decorating skills another day. Yes, I said the other day that I was done on the blog until January first. Well, I couldn’t help it. This was too good not to share before the holiday. This frosting is da bomb. It is the most incredible thing I’ve had in a long time. The Peppermint White Hot Chocolate put me on a white chocolate kick and I haven’t been able to get off of it. I’ve been in the kitchen, blasting Christmas carols, cooking and baking up a storm, enjoying it. The other day, I ran across a family recipe for a vinegar cake and converted it to being soaked; it was done easily since the recipe already called for vinegar. So I made it chocolate, converted it to being soaked and turned it into cupcakes. That cake recipe can be viewed as a guest post on The Grain Mill Wagon. It’s gluten, dairy and egg-free. I’m very happy with how it turned out. Well, since I had cake, I needed frosting. 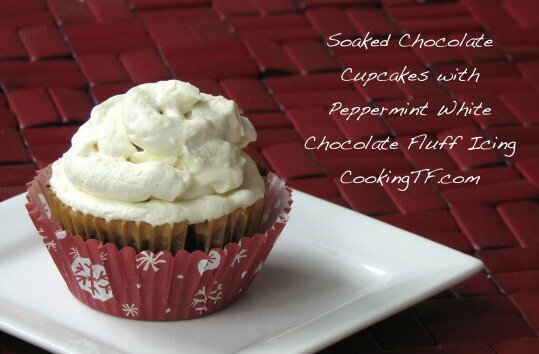 I originally wanted to do a marshmallow-style frosting, then decided I was in the mood for peppermint with my chocolate. Again. That cocoa butter sitting on the shelf started calling to me, asking to be used. This little concoction is the result. The icing starts off soft and cloud-like, then solidifies into a light but solid texture that my kids loved. The white chocolate flavor was very clear. If you want less of the white chocolate flavor, reduce the cocoa butter in the recipe. That will soften the texture of the cooled icing, as well. Of course, you can also leave out the essential oil if you’d like. I took the excess frosting and put it into a silicone candy mold. They make great treats. If you’d prefer a regular buttercreme texture, then add additional coconut cream, refrigerate the icing after whipping, then thaw it and return it to the stand mixer and beat until the texture of buttercreme. My first batch of icing turned out that way. I left it in the fridge too long and found out the hard way. But I used up the last of my cocoa butter that way, so it can no longer sing its siren song from the pantry shelf. Must order more. Yes, I know I will take some heat for including powdered sugar in a recipe on a real food blog. But it’s the holiday and this is literally the only thing we will have with white sugar in it. Considering the amount of sugar you wind up with per cupcake, it’s pretty small. And since this is the only white sugar I’ll likely consume for months, I’m ok with that. This icing hardens quickly, so you will want to go ahead and get a piping bag fitted with your choice of tip, or a ziplock bag with one corner snipped off. Set aside. In a small saucepan, melt the cocoa butter over low heat and remove from the heat. Set aside to cool until it is just warm to the touch. Meanwhile, in the bowl of a stand mixer fitted with a whisk, combine the shortening and sifted powdered sugar and beat until smooth. Beat in the coconut cream. Once the melted cocoa butter is just barely warm to the touch, whisk it into the shortening mixture in a slow, steady stream on low speed. Turn the mixer to high and beat until light, fluffy and stiffened, 3-5 minutes. Beat in the peppermint oil, taste and adjust to your liking. Immediately transfer to your piping bag and pipe onto the cupcakes before the frosting hardens. Store leftover frosting in the fridge, separate from the cupcakes, or in candy molds. Do you mean “cacao butter”? I couldn’t find cocoa butter at The Green PolkaDot Box website. Cacao butter and cocoa butter are the same thing, it looks like. I used the cocoa butter from Wilderness Family Naturals, but it looks like GPDB currently is out of stock. The Cacao butter from Divine Organics will work just fine, too.